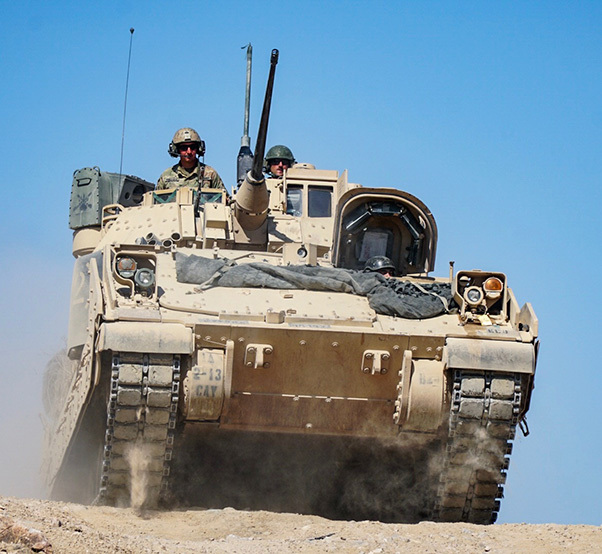 Soldiers assigned to 2nd Squadron, 13th Cavalry Regiment, 3rd Armored Brigade Combat Team, 1st Armored Division maneuver a Bradley Fighting Vehicle during training operations at the National Training Center in Fort Irwin, Calif., May 27-June 17, 2018. Soldiers with 3rd Armored Brigade Combat Team, 1st Armored Division completed a month-long decisive action training rotation at the National Training Center at Fort Irwin, Calif., June 16, 2018. 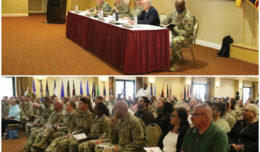 “The National Training Center is the culminating event that incorporates all of the training during Bulldog and Iron Focus,” said Col. Robert E. Lee Magee, commander of 3 ABCT, 1 AD. Bulldog Focus and Iron Focus, successive qualification exercises at home station, were the first two steps in a gated training plan that led up to the NTC rotation that began in May. 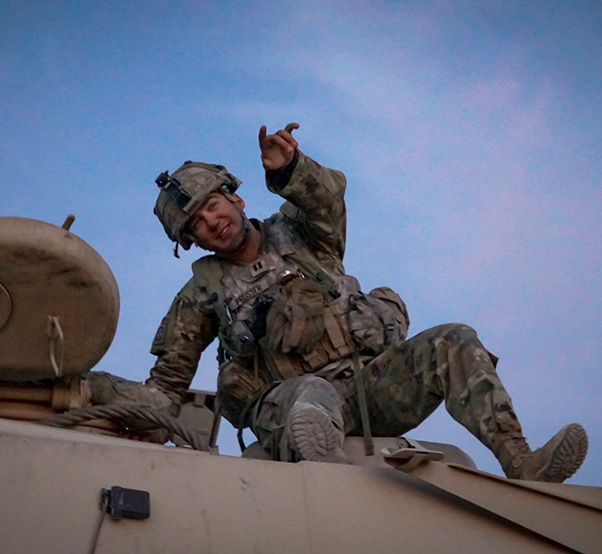 “Our Soldiers have done outstanding in every event we threw at them, and I know they’ll be successful as we continue to put them to the test during NTC and other future missions,” added Magee. 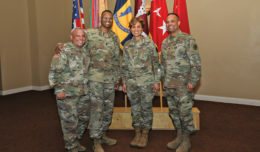 The Bulldogs’ experience during the NTC rotation enabled the commander to focus leadership, training, and resources on improving the brigade’s combat readiness to meet future contingency requirements. 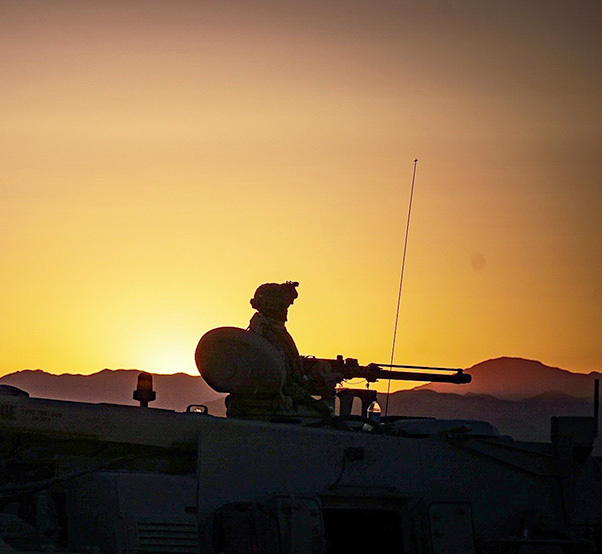 A Soldier assigned to 3rd Armored Brigade Combat Team, 1st Armored Division conducts security operations while in Fort Irwin, Calif., for National Training Center rotation 18-08, which began May 27 and lasted three weeks. NTC tests Soldiers and prepares them for real-life situations they may face in combat. 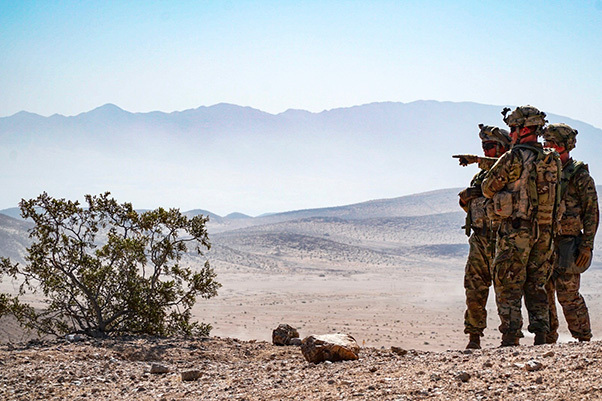 The NTC replicates the tough, realistic operational environment that the brigade could face in combat. This extends beyond simply fighting an enemy force. “NTC does not only train Soldiers for a firefight, but has many role players that act as key leaders, local civilians, refugees, and any other real-life role in a sovereign state,” explained Maj. Patrick Benitez, commander of the 416th Civil Affairs Battalion from San Diego, California, an enabling unit that joined 3 ABCT for the training rotation. The training scenario put the brigade in a fictitious country called Atropia fighting against an enemy nation called Donovia, Benitez added. In addition to fighting an enemy, the Bulldogs had to mitigate situations such as local civilian protests and host nation humanitarian issues. The training exercise showed the brigade that there are long-lasting effects for every action they took. Soldiers assigned to 3rd Armored Brigade Combat Team, 1st Armored Division discuss their next training mission at Fort Irwin, Calif., during rotation 18-08 the National Training Center. 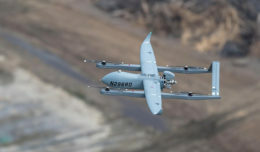 The rotation began May 27 and lasted three weeks in the Mojave Desert. In “the box,” the training area where the brigade fought simulated force-on-force battles with NTC’s opposition forces, the Bulldogs tested their lethality using a complex system of lasers and sensors called the Multiple Integrated Laser Engagement System, or MILES. The MILES gear replicated firing weapons and taking damage and casualties. The equipment was attached to every person, weapon system, and vehicle to track 3 ABCT’s effectiveness in the fight. Using those statistics, 3 ABCT’s Abrams master gunner, Staff Sgt. Jack Edwards, learned how to create a more lethal force among the brigade’s M1A2 Abrams tank crews. “NTC is about measuring the brigade’s ability to destroy the enemy, assess that ability, and improve it to make it more lethal,” he said. 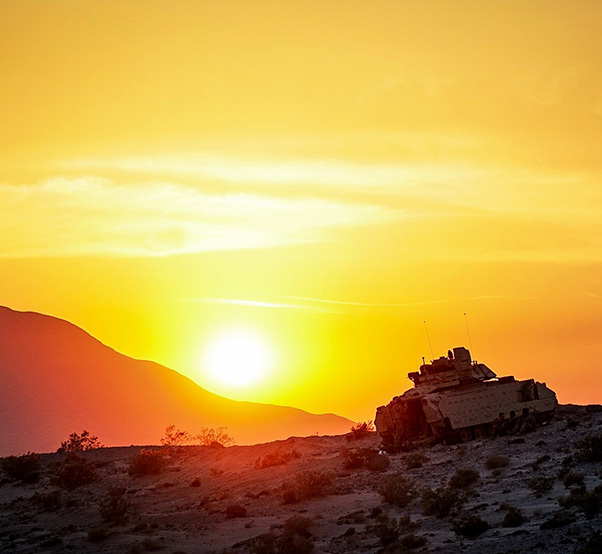 A Bradley Fighting Vehicle climbs the side of Mount Tiefort Mountain in Fort Irwin, Calif., at sunset in preparation for a training mission during rotation 18-08 the National Training Center May 27-June 17, 2018. Throughout the training rotation, 3 ABCT exercised not only the combat arms skills of the brigade, but also incorporated enabler units from special operations, civil affairs, psychological operations, cyber operations, and chemical, biological, radiological, and nuclear operations to strengthen the brigade’s ability to fight across multiple domains. NTC is America’s platform for brigade combat teams to continue to develop where they shine, as well as learn where they can grow. Conducting the NTC rotation made sure 3 ABCT has lethal battalions that can shoot, move and communicate on the modern battlefield and will be highly trained and ready when the nation calls. Capt. Edward Preisser, commander of Headquarters and Headquarters Battery, 4th Battalion, 1st Field Artillery Regiment, gives commands to vehicle operators during rotation 18-08 at the National Training Center in Fort Irwin, Calif., May 27-June 17, 2018. 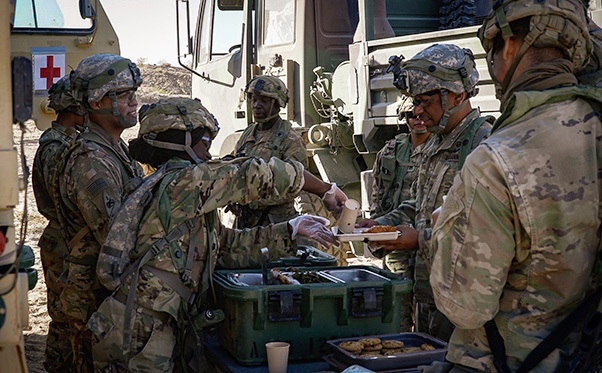 Soldiers with 3rd Armored Brigade Combat Team, 1st Armored Division serve a hot meal in the field for dinner during rotation 18-08 at the National Training Center in Fort Irwin, Calif. May 27-June 17, 2018. Pfc. 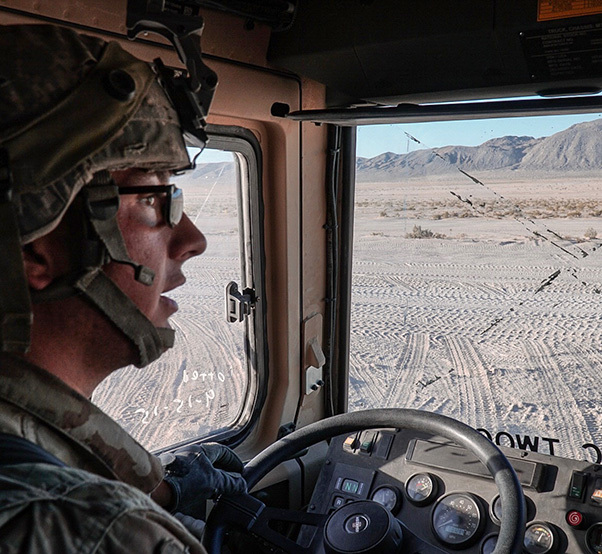 John Keim, a firefinder radar operator with 3rd Armored Brigade Combat Team, 1st Armored Division, drives a Light Medium Tactical Vehicle through the National Training Center in Fort Irwin, Calif., during rotation 18-08, which began May 27 and lasted three weeks.